The MOSSAR and KSSSAR Color Guard are shown here after the presentation of the Portrait of President George Washington at Ozanam located in Kansas City, Missouri on Thursday, April 5, 2012. 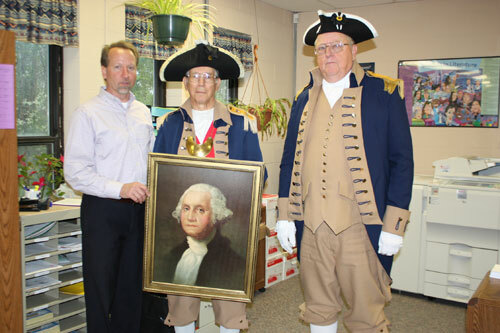 The Portrait of President George Washington has been retired after 25 years of service, which has been displayed at local George Washington Celebrations in Kansas City. Mrs. Minx, a class about eight students, their teacher, the Librarian, along with Carolyn Grover and Pat Fry were also present for the dedication. The print will be displayed in their library. Photo (L-R): Mr. Doug Zimmerman, Major General Robert L. Grover, MOSSAR Color Guard Commander, and Compatriot Dewey Fry (KSSSAR), Chairman of the George Washington Celebration Committee.